In February 2016, Olympia School District voters overwhelmingly approved a bond measure to address facility and safety improvements districtwide. This webpage has been created to update the community, as well as students, families, and staff, about the progress of the various construction projects. This page will be updated regularly with articles, photos and videos, as well as links at the bottom of the page to related information. Photos and videos featuring bond projects will also be featured on the school district's Facebook, Twitter and Instagram social media pages. On October 2, 2018, the Olympia School District completed the sale of $72 million in bonds to finance major school renovations across the district. This bond sale is one of three installments of a total of $160 million in bonds authorized by voters in 2016 to pay for major renovations and class size reductions across the school district. While this installment will contribute to many projects, the district is currently focused on remodeling three elementary school buildings (Roosevelt, McLane and Centennial elementary schools), and beginning the remodel of Capital High School, construction of a performing arts center at Capital High, constructing new classrooms at Olympia High School, installing a new turf field at Olympia High, and expanding Avanti High School. 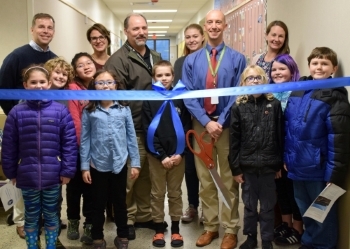 Five major projects have been recently completed: mini-buildings of 10 classrooms each were constructed at Roosevelt, McLane, Centennial, Hansen and Pioneer elementary schools. These mini-buildings give the district the capability to reduce class size and help ensure that the district does need to lease space in order to provide basic education services. In addition, the district recently renovated the Capital High School track and installed a turf field for football, soccer and other field sports. The true interest rate of the bonds sold on October 2 will be 3.56% over 20 years. Progress is visible throughout the school district on construction projects approved by voters as part of the February 2016 school improvements bond. Remodel projects at Roosevelt, Centennial and McLane are well underway and making significant progress this summer. Each school will retain its' original footprint and exterior while being renovated from floor to ceiling. The projects include, among other things, new windows and roof, new electrical, plumbing, heating and cooling systems and seismic upgrades. In addition, each of the schools will have a more secure entry system and an updated facade. The new buildings will have higher ceilings and much more natural light. Projects will continue through the 2018-19 school year and are scheduled for completion prior to the start of school in September 2019. One of the most visible bond improvements has been the addition of a two-story classroom mini-building at five of the district’s 11 elementary schools. Construction began in February 2017, and three of the five mini-buildings (Hansen, Pioneer and Roosevelt elementary schools) opened their doors to students during the 2017-18 school year. Plans are to open the remaining two classroom mini-buildings at McLane and Centennial elementary schools just prior to the opening of the 2018-19 school year, said Kurt Cross, director of capital planning and construction. The 10-classroom mini-buildings provide space needed to comply with state-mandated smaller class sizes, while also reducing reliance on portable classrooms. Each of the mini-buildings has eight classrooms, a music room, a commons/general classroom space for multiple uses, small learning areas between classrooms for small-group teaching and learning, a musical instrument storage area, and an administrative office and storage area. Each building also has a covered walkway connecting it to the main school building at each site, an elevator, two sets of stairs, and student and staff restrooms on each floor. 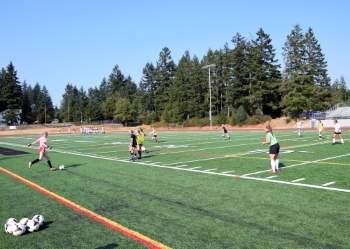 A new synthetic turf field and accompanying track improvements, which benefit both Capital High School students and the surrounding community, opened just in time for fa ll sports practice in summer 2017. The track and field is used year-round thanks to the installation of recreational low-level field lighting. Community members may request purchase of an electronic key card giving them access to the track and field for personal, recreational use during specific public access hours. Olympia High School: Refinished wood floors, including new striping, in the main gym and auxiliary gym; new Light-Emitting Diode (LED) scoreboards (two in the main gym and two in the auxiliary gym); additional wall pads in the main gym; upgraded heating and cooling units; and roof replacement. 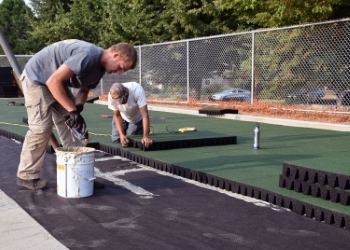 Capital and Olympia high schools: Resurfaced tennis courts at both Olympia and Capital high schools. Avanti High School: Installation of fire sprinklers in the adjacent Knox Administrative Center warehouse. The sprinklers allow an area of the warehouse to be used as an Avanti High School learning space, such as for robotics and a weight room. Olympia Regional Learning Academy (ORLA): Solar panel installation. The school was selected for a State of Washington Department of Commerce 2016 Energy Efficiency Solar Grant award. Marshall and Washington middle schools: A new roof at Marshall Middle School and new coating improvements to the Washington Middle School roof. Reeves Middle School: Fire alarm system replacement. Jefferson Middle School: Service yard improvements along Conger Avenue N.W. to support the installation of a commercial trash compactor. LP Brown Elementary School: Rearranged how a pipe drains out of the school, thus improving the drain flow from the kitchen and adjacent restroom. Lincoln Elementary School: Installation of a new playground and grass play field, as well as some interior Light-emitting diode (LED) lighting. Thanks to the many parent and community volunteers who installed the new playground equipment and to the City of Olympia for a grant to help purchase the playground equipment. Madison Elementary School: Installation of two portable classrooms. The classrooms were formerly located at Centennial and Roosevelt elementary schools, which are being remodeled. McKenny Elementary School: Installation of a new heating and cooling system (geothermal heat pump), a new natural grass play field and refurbished baseball field. Transportation department: New fire alarm installation. Elementary schools districtwide: Installation of security cameras completed at elementary schools districtwide. What is planned during the 2018-19 school year? Elementary school remodels: Construction is underway for remodeling Roosevelt, McLane and Centennial elementary schools. The projects began construction in May 2018 at Roosevelt, followed in June 2018 at Centennial and McLane elementary schools. The remodels are estimated to be completed in August 2019. Classes are continuing at each of the school sites during the remodels. Capital High School Performing Arts Center: Design work continues this year, followed by construction estimated to begin in June 2019, on a new 500-seat Capital High School Performing Arts Center. The bond project also calls for improvements to the school's exterior, as well as the heating and cooling system. The project is estimated to be completed in August 2020. Olympia High School classroom and field improvements: Design work continues this fall, followed by construction starting in June 2019, on a two-story classroom building near the high school Commons, four additional science rooms located near existing science classrooms and an additional music room near the existing music classroom spaces. Additionally, a synthetic turf field will replace a grass field just east of Ingersoll Stadium. The project is estimated to be completed in August 2020. Avanti High School expansion: Design work will begin this year on the remodel of the Knox Administrative Center to support expansion of Avanti High School. Construction is estimated to begin in 2020. District Administrative Center move to new building: District administrative offices will move in summer 2019 to the building formerly housed by The Olympian newspaper. Marshall Middle School roof: New gutters will be installed on the roof at Marshall Middle School. Be sure to visit the school district's Facebook page for additional bond project updates, including news articles, photos and videos. In related news, the Olympia School District Board of Directors approved the 2017-2022 Capital Facilities Plan. This is a road map that guides the district in its facility-related planning.